Another installment of Superbowls Around the World! “The smart thing to do is to stay home and watch the game on TV,” I said to myself on Saturday afternoon. 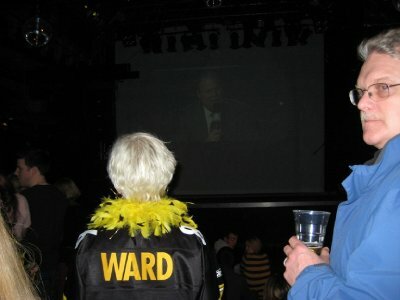 Superbowl is well covered here in the UK, showing on both BBC and Sky Sports. It would be no problem to watch it on my couch. And as the game starts at 11:30 PM local time and I had an 8 o’clock train to catch up to Sheffield, staying in seemed like the smart move. But this is the RELAUNCH of the Superbowls Around the World blog series. After making a big deal of it in a blog entry I posted, I couldn’t just wind up saying that I ended up sitting on the couch in my apartment watching TV. No, I need to do it right. So I searched on line and found that a surprising number of places were staying open to show the game. The NFL is actually more widely covered here than I would have expected. In the regular season games are shown on Sky Sports, and the regular season tilt that has happened for the past two years at Wembley is always a big deal. I choose to forgo the sports bars and their cover charges and head instead to a party put on by the American expat Meetup group. 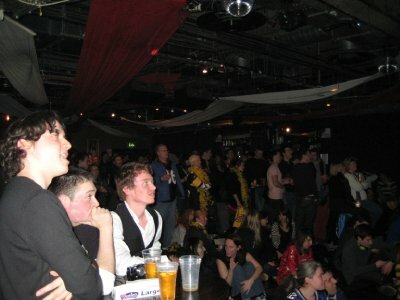 The party, with an expected attendance of 800 people, was to be hosted in Islington. Islington is far from my place in Isle of Dogs, but close to St. Pancras station, where I needed to get my train out the next morning. With the game ending sometime around 3 in the morning, heading back to Isle of Dogs for a couple hours of sleep and then heading back to almost where I just was didn’t make much sense. Therefore, I decided to splash out and get a hotel near St. Pancras. I headed out to the hotel around 4 pm, and decided to take an afternoon nap, as I knew sleep wouldn’t be something I got much of later in the evening. I woke a few hours later and looked out my window. I opened the drapes, and wondered if the hotel had somehow moved across the ocean to Canada while I slept. There was snow on the ground. Lots of it. 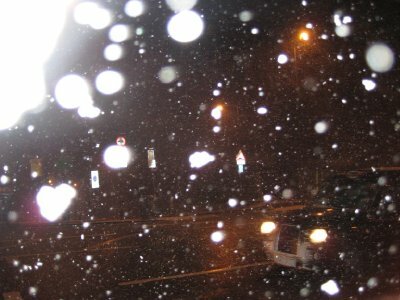 London and the south-east of England was in the middle of a winter storm, which by its end would dump more snow on the capital than it had seen in 18 years. The snow, however, didn’t stop those wanting to see the game from heading out. 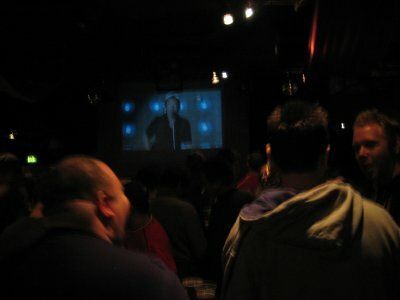 The Superbowl party hosted by the American expat group had over 1,000 people in attendance, watching the game on a projected screen in what appears to be a dance club in its other life. Oddly, there were a lot of people wearing jerseys from other teams, even across other sports, including a guy in a KC Royals jacket. I guess wearing something American sports related was in the spirit of the night. The expat group had managed to stream the video of the NBC from America, so we had all the American commercials, the American commentators and all the half-time show, including Bruce Springsteen. In the end, Pittsburgh won what ended up being a very close game. 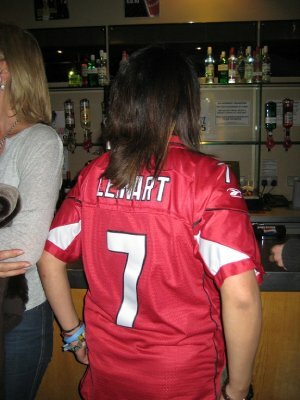 I had been cheering for the Arizona Cardinals as I had just spent 2 months there, so I was slightly disappointed by the outcome, but happy to have actually bothered to go out, rather than staying at home. Leaving the venue around 3 AM I was hoping to catch a night bus back to my hotel, but never saw one come along, and ended up walking the 25 minutes back to my hotel. I found out the reason for this the next morning as I woke up. 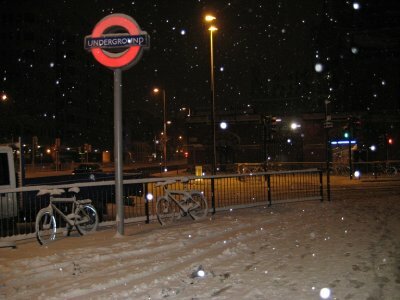 The snow had hit London hard. All the airports were closed, none of the buses were running, most of the tube lines were shut or suffering serious delays and many of the trains were running delayed schedules. The next morning, having stayed in a hotel right by St. Pancras station, I was able to walk to the station and catch my train up to Sheffield. East Midlands, the company that runs the London – Sheffield train, was one of the only companies in London that wasn’t delaying their schedule, and the train left right on time, though mostly empty, as very few people could make it to the station with few tube lines or buses running. So, had I done the smart thing and watched the game at home (or even the really smart thing and went to bed early), I wouldn’t have made it to work on time this morning (if I could have made it at all). Only through choosing to go out did I ensure that I could make it up to Sheffield. 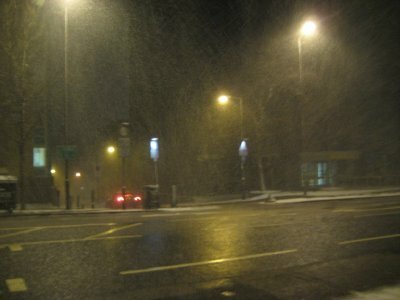 I arrived in Sheffield, in “Northern” England, to find less snow, though they are expected to get it tonight. Luckily my hotel is only a 3 minute walk to the office. 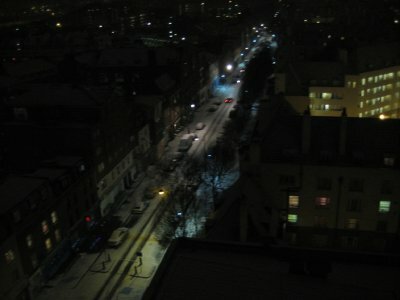 So, I end with a few pictures from last night and this morning of the snowy scenes in London. I hope no one accuses me of bringing the snow here from Canada. I promise you all, when I moved here I really had hoped to leave the snow behind. 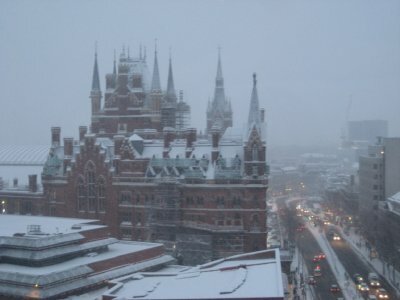 Snowy London town looks absolutely smashing! Glad everything worked out for you! None of that stuff here, I am glad to say. We was jobbed!! This is so intersting blog! I'm looking forward to sharing the pleasures with you!